We offer weatherization services in Myrtle Beach, Charleston, Sumter and nearby. Call us today to schedule a free quote! Free Quotes for all recommended weatherization work. Call Carolina Energy Conservationfor affordable and expert weatherization improvements. 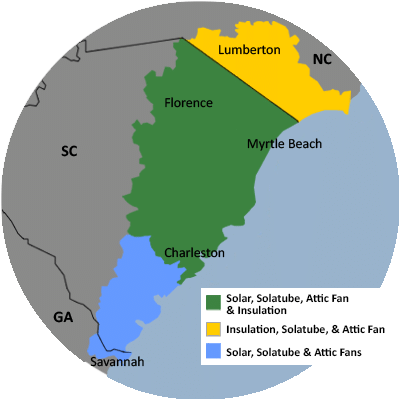 Carolina Energy Conservation’s highly trained weatherization installers and technicians can transform an uncomfortable, energy-wasting house into a comfortable, energy-efficient “green” home. Using some of the best performing materials available (caulk, spray foam, different types of insulation, door sweeps, weatherstripping, gaskets and more), Carolina Energy Conservation can complete all the weatherization upgrades you select. Wouldn’t you like your house to be more comfortable and less expensive to live in and own? Get started today by call Carolina Energy Conservation for a free weatherization evaluation and quote.